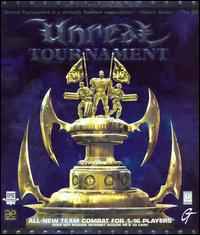 Before the highly anticipated Quake3, there came UT on the market and it came as a surprise to many that it was so good. Especially the new game mode Assault (one storms a fortress or escapes from a prison) arouse enthusiasm in players. After a round, the sides are changed and one must beat the time of other team. All levels are well-formed without exception and are eventful. A tournament procedure became implemented in which one fights only against Bots (in the team modes one gets Bots put on their own side too and can give to them orders). You must go through other modes such as Last Man Standing, Dominion, Assault and 3 extreme Deatmatch levels to a final opponent in Deathmatch. The good graphics and the diverse levels, as well as the intelligent Bots already make the single player game a lot of fun, but especially on the network with teams, this Tournament is quite Unreal and brilliant. Taking the action to a sampler of sci-fi settings such as a spaceship hurtling through space and skyscrapers so tall that there was low gravity at the top, the UT maps gave a startling sense of putting the battles in exotic locales. Location-based headshots made the sniper rifle a force to be reckoned with. The alternate firing mode of the shock rifle made timing-based combo attacks possible, while a supercharged rocket launcher fired up to six explosive rounds at once. Even the lowly pistol could be satisfying when you picked up a second and ran around Chow Yun Fat-style, with two guns throwing out rounds twice as fast. The mutator format made it easy to package and distribute minor gameplay tweaks, such as instagib game types or low-gravity settings. Since the mutators acted on the game servers, players didn't have to download anything extra themselves; they just had to join a game with a given mutator enabled. UT's mod scene also provided a decent selection of free content, such as the popular Tactical Ops mod, which aped the massively popular Counter-Strike but with UT's much better graphics under the hood.